There's virtually nothing pleasant about the job hunting process—an unfortunate fact of life. Between interviews, worrying, scourings listings, and worrying some more, anything you can do make the process easier the better. Resume Designer for iOS at least helps you take the thought and stress out of putting your entire life down on paper. The best part? You can make one on the go. 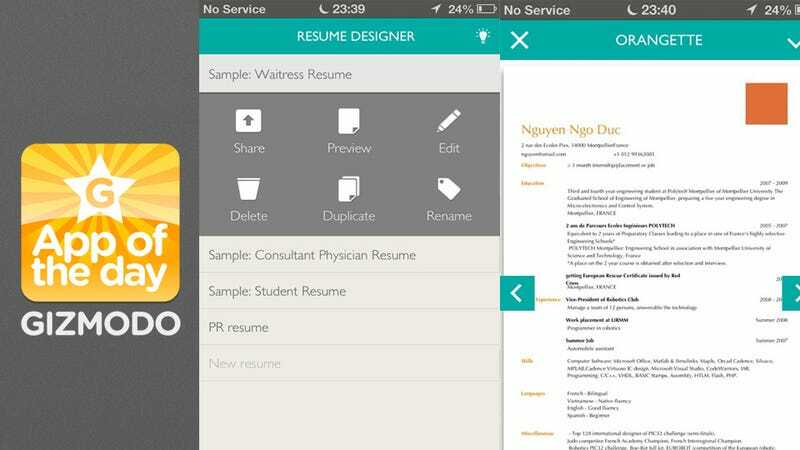 Let's you create, edit, and email full, beautiful resumes, entirely on your phone. Both pre-made templates and blank pages act as possible starting points, and you can customize the various sections as you see fit (using both suggested headers and your own). And without ever having to open Word, you can adjust spacing, font, size, and anything else you might want to change, such as adding a photo of yourself. Depending on the current state of your job or your current career in general, this app is going to apply those of a more freelance, transient variety. But if you're the type who constantly has to market yourself to new clients or employees, this app could prove invaluable for chance, off-the-cuff meetings and opportunities. You have plenty of convenient options for sharing your life's work: AirPrint, email, or converting to PDF. Plus, iCloud sync makes it super easy to pick up where you left off. Plus, there's even support for cover letters.